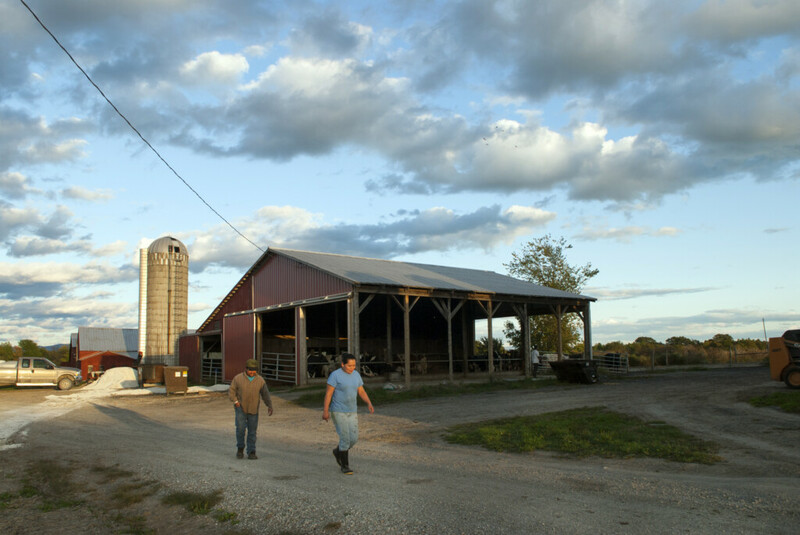 Felipe and Enedina going to work at a dairy farm in Addison, Vermont. I first started photographing Latino farm workers in 2006, after I noticed several young Mexican men shopping at the Whiting General Store. Vermont is not very diverse and I wondered what these men were doing in the rural Green Mountain State. It turns out they were milking cows. I teamed up with ESL and Spanish teacher Chris Urban, who knew many of the workers, and we created a multimedia exhibit called “The Golden Cage – Migrant Workers and Vermont Dairy Farmers”, with help from the late Greg Sharrow at the Vermont Folklife Center in Middlebury. The exhibit has toured the state, been published in Vermont Life and been shown at Senator Bernie Sander’s office in Washington, DC. It has helped raise awareness about how migrants play a crucial role in Vermont’s economy and about the need for immigration reform. The organization Migrant Justice was formed in 2009 in Burlington, Vermont and organizes for the economic justice and human rights of farm workers in Vermont. Sami Santos Rincon milking cows with her baby son Brian in Shoreham, Vermont. An important contact for the project was Susan Veguez, who is friends with many of the migrant mothers and children. In 2008 I photographed her friend, Sami Santos Rincon, milking cows with her baby son Brian in a car seat cloaked in mosquito netting to protect from flies. Sami and Brian are now back in Mexico and Brian is thirteen years old. 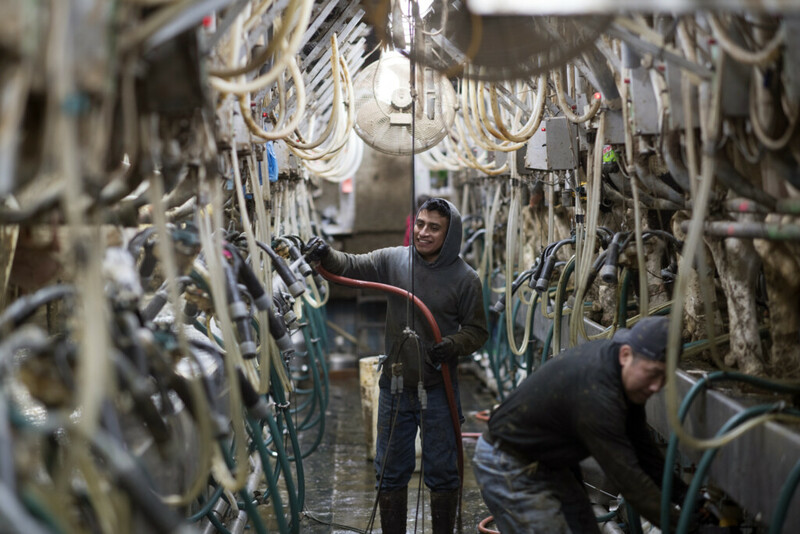 Victor Diaz and Ivan Dominguez in the milking parlor at the Vorsteveld Farm in Panton, Vermont. Over the thirteen years since I have been working on this project, life moves on. I lost my brother Roger to cancer in 2009, which left a gaping hole in our family. We carried on, keeping him always in our memory. In 2013, our son was born prematurely at Dartmouth-Hitchcock Medical Center. He spent three months in the hospital before coming home. He is now a healthy and happy five-year old who loves building with Magna-Tiles and hiking to Silver Lake. I can only imagine what’s gone on in the lives of the farm workers I photographed. Many have returned to Mexico or other Central American countries. Some are still here in Addison County, adding to the economy and culture of Vermont. I am grateful for photo editor Mary Vignoles for helping me create this new edit of my migrant worker project. As a photographer, you get attached to certain images for whatever reason, and it can be very helpful to get an outside perspective on editing a photo essay and making it stronger. Most recently I made photos of migrant workers at the Vorsteveld farm in Panton, Vermont a few weeks ago for a cover story by Chelsea Edgar in Seven Days. I had been at the farm in 2015 for a New York Times story on migrant workers and had photographed Victor Diaz. Back then I did not meet the Vorsteveld brothers. But this time I did meet Hans, Rudy and Gerard Vorsteveld. It was great to come full circle and photograph the dairy farmers and the migrant workers, as a team, milking cows in the Vermont countryside every day of the year. Check out the full portfolio on my website.